Last week I highlighted some sun care products I really love, for both body and face. 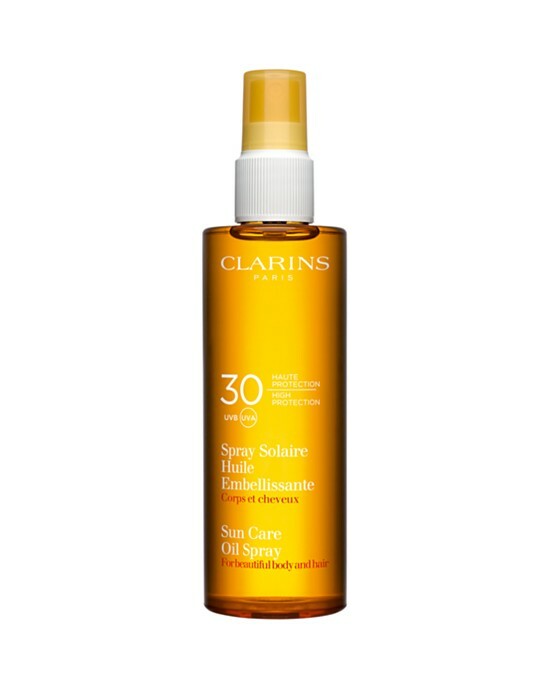 Today, I want to share with you the new Clarins Sun Care Oil Spray Spf 30. What makes this sun protection product different is it has the added benefit of being a 2-in-1 product, protecting skin and hair. That means there's fewer products to pack in your beach/travel bag, and you get the benefits of sun protection everywhere. Although this is an oil formula, I was very impressed by how lightweight it felt. Once I sprayed Clarins Sun Care Oil Spray on, I got an instant glow, but it absorbed just as quickly so that it was dry to the touch. This is perfect to add to dry or slightly damp hair as a protecting pre-treatment before prolonged sun exposure outdoors, or swimming in the ocean or pool. Clarins Sun Care Oil Spray doesn't leave hair gummy, sticky or greasy either (just a few pumps is all you need though!). It left my hair smooth and soft and it also helped tame the frizzes when it was humid. It has a very subtle orange/citrus scent that's clean and fresh and very much unlike the typical "sunscreen" scent.